Keto Thermo - Use the Discount Savings Button to calculate savings then enter a quantity of your choice to complete your order. Aloe + Probiotic - Use the Discount Savings Button to calculate savings then enter a quantity of your choice to complete your order. Supports healthy bowel function. �60 capsules. Calcium World's Best - -Use the Discount Savings Button to calculate savings then enter a quantity of your choice to complete your order. 38 ingredients including D3, K2, Magnesium, Potassium, Turmeric, Glucosamine, MSM, Zinc and More Supports Cholesterol, Blood Pressure, Joint and Bone Health. Co Enzyme Q10 120 mg - Use the Discount Savings Button to calculate savings then enter a quantity of your choice to complete your order. Digest Foods Capsules - Use the Discount Savings Button to calculate savings then enter a quantity of your choice to complete your order. This combination of digestive herbs supports digestion and absorption of nutrients needed by the body to function instead of malfunction. Supports a healthy digestive system against symptoms of heartburn, acid reflux, indigestion, Gerd, gas, burping/belching, bloating, diarrhea, constipation, hemorrhoids, colitis, IBS, IBD, diverticulitis, Crohn's disease. and malabsorption. Popular heartburn drugs may increase esophageal cancer risk and weaken bones. Heart & Body - Use the Discount Savings Button to calculate savings then enter a quantity of your choice to complete your order. Heart & Body daily multiple vitamins and mineral complex has 84 ingredients and 42 fruit and vegetable proprietary blend. Heart and Cardio is for supporting cardiovascular health and to help maintain health levels of Cholesterol, Triglycerides, Blood Pressure, Homocysteine, and CRP (C-reactive protein). This miracle combination of 23 ingredients of herbs, minerals, vitamins, and amino acids, provide natural anti-inflammatory nutrients delivered by the blood stream through out the body to joints, soft tissue, ligaments, tendons, disk, bones, blood vessel walls and muscles. Reduced inflammation equals less pain and swelling. Plus providing the body with nutrients to repair, rebuild and rejuvenate. Probiotic - Good Bacteria - Use the Discount Savings Button to calculate savings then enter a quantity of your choice to complete your order. Is it time to help the liver do its job and perform well for you? Toxic wastes can accumulate in the colon and liver, and then can circulate throughout the body via the bloodstream. Some symptoms of this condition can include depression, irritability, fatigue, gastrointestinal irregularities, acid indigestion and allergies. The liver controls the thyroid, makes the bile stored in the gallbladder and works with the pancreas. The liver stores excess fat leading to a fatty liver. This combination formula has 28 nutrients to nourish eyes. Vitamins and herbs that support healthy vision that may aid eyes in loss of vision, cataracts, floaters, macular degeneration, glaucoma, night vision, diabetic retinopathy, Bitot's spots, computer eye strain, blood shot eyes, and eye fatigue from driving distances. Combination of 30 ingredients in this product. �Great combination when used with the multiple vitamins. Biotin, Folic Acid, Vitamin A, Vitamin C, Vitamin D3, Vitamin B1, Vitamin B2, Vitamin B12 to name a few. This combination is designed to provide nutrients that are usually deficient or depleted within the body for healthy looking skin, hair and nails. Taking a single vitamin or mineral may be ineffective and not all vitamins are made to high standards, using quality ingredients, and combinations needed for assimilation. �Mild Silver Protein Nasal Spray. Purchasing a $49.95 Annual Pass Autoship allows you to become a Loyal Customer and receive a discount of 25% off regular price.� After you purchase the pass you will receive an email of the invoice and then a follow up email of instructions. Click on the product name to learn more about each product.� To return to this screen click the back arrow button at the top of the page. 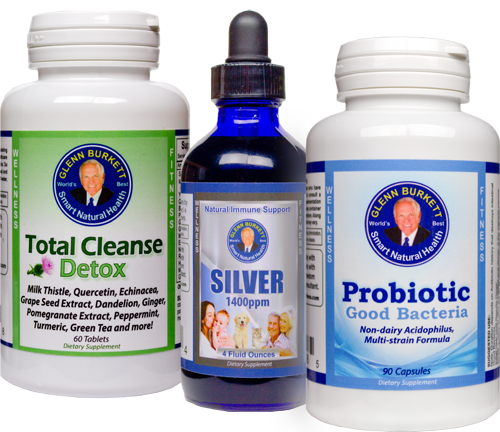 Probiotic�supports healthy digestive system (digest & absorb) and immune system. Total Detox�supports healthy liver, kidneys, intestines, colon, skin, and lymphatic system.